A large percentage of solar arrays are installed on appropriate roof surfaces or open land in the case of ground-mounted systems. However, some of the greatest opportunity for simple, successful installations actually comes from an unexpected source – brown fields and land not otherwise considered suitable for traditional development. This can include property with subterranean bedrock that cannot be penetrated by beam-driven ground mounts, landfills which must not be penetrated by beams or anchors, and property that is heavily paved or contains numerous other obstructions. In these scenarios and others like them – non-penetrating groundmount systems offer a significant return on what is typically low-cost land or land with low property value by generating an additional source of revenue for property owners. 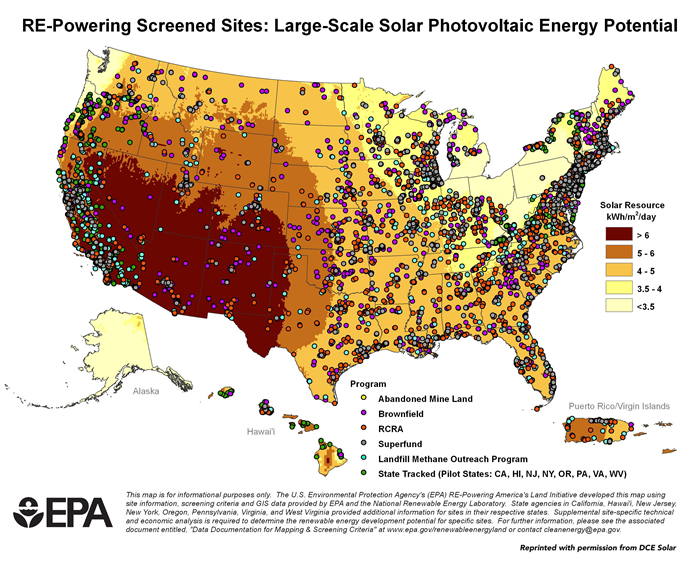 With the right equipment and understanding about how to maximize the potential of these types of arrays, property owners and developers can find an accessible entry point into the world of solar energy with the ability to offset costs of ownership and maintenance while also projecting a “green” company image to neighbors and stakeholders in the surrounding area. While beam-driven ground-mounted arrays are indeed popular, they are not without challenges. Some of these include soil types, terrain, drainage, and other variables that can impact overall performance of the array over time. For a complete analysis of beam-driven challenges please refer to the DCE Solar Guide to Safely Installing Solar Panel Arrays to Any Property Type. Because ballasted ground mounted systems are in physical contact with the ground surface, corrosion resistance is paramount. The ability for any system to perform on this level can be most readily assessed through composition and construction. PROS: exterior coating provides better corrosion resistance than raw/uncoated construction. Can be less expensive than other materials. CONS: slightly more expensive than non-coated products, must be applied prior to rack or system assembly (during manufacturing process). Another point of concern is the speed and accuracy with which an array can be successfully set up and installed. The more simple the design, often, the more quickly it can be implemented according to manufacturer recommendations – reducing overhead associated with man-hours and producing a value-driven installation cost for developers and property owners. This also provides a competitive advantage for installers by presenting a value point that can be passed along to customers as a price savings, while still leaving an acceptable profit margin for the installer. As with all solar installations, arrays must be firmly immobilized in position in order to ensure maximum safety and performance. Primarily, this is achieved through the weight of the ballast and the friction between the system and the ground surface. At the same time, however, ground friction against metallic surfaces can expose racking systems to greater risk of corrosion and premature failure. Fortunately, there are design considerations that can increase the coefficient of friction between the ground and the system, which in turn also increases the stability of the entire installation. One such design feature being used today is integrated slip-resistant cross members along the base of ballasted ground-mount array frames. Such inclusions also help reduce ballast requirements necessary to meet wind requirements per region. This approach also offers significant advantages over pour-in-place systems that may not be appropriate for minimum point load requirements of landfills and other areas sensitive to ground penetration or weight. Often, the heavy cement pumps and equipment necessary for a cost-effective pour-in-place solution are too heavy for the limits of the installation site. Smaller carts and more man hours for transporting cement quickly offsets any potential savings that may have been realized through the pour-in-place method. Clean-up and other considerations can also be avoided with block ballasted systems. The decision to convert a property’s use to solar can be confusing. Is it better to choose low-cost equipment and materials – hoping that it will help capture returns through low prices? Or, is it better to implement industry-leading equipment and materials at a higher cost, but with better long-term performance, faster installation, and fewer costs associated with maintenance? What some of the premier ballasted ground-mount systems offer to virtually all properties is a quick route to qualified expertise with design and assembly that minimizes learning curve and accelerates installation time. Developers can expect to recoup significant man hours and save on installation and implementation costs over more complicated designs. 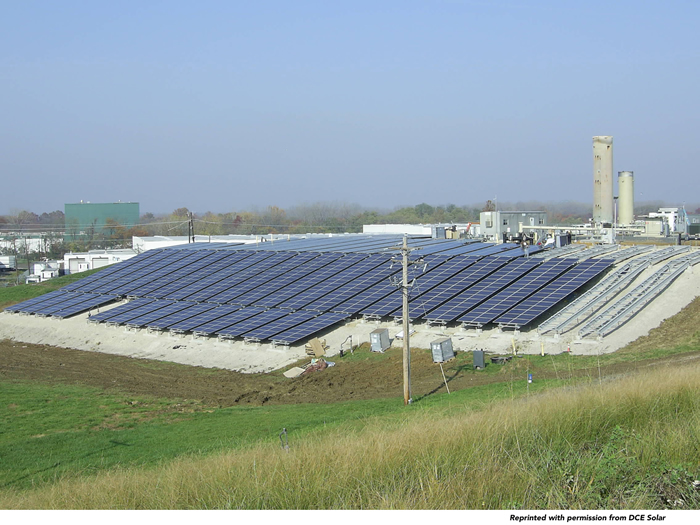 Brown fields, landfills, and other properties ideal for non-penetrating ground mounts represent a significant opportunity for developers and property owners as the solar energy industry continues to expand. Knowledge and expertise with these unique property types and the systems best suited to the terrain and other considerations are vital to successfully transforming under-performing land to positions of profitability. Choosing manufacturers and products that simplify your start-up time and positively impact your bottom line is one of the smartest ways to support your business in this rapidly expanding field. DCE Solar is proud to have been a part of the clean energy movement since 2009 and are committed to expanding the availability and use of clean energy to homes, businesses, and properties throughout the country.